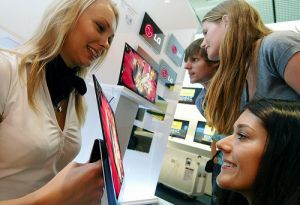 LG announced that they will increase their total investment in 2011 by 12% - to 21 billion won (over $18.8 billion). About 70% of this investment will go for LG Electronics and LG Display, which will continue work on AMOLEDs, 3D displays and e-paper. Last month we reported that LG's AMOLED investment in the next 5 years might reach $7 billion, and will include 4.5-Gen lines, 5.5-Gen lines and larger ones later on.